The parents of Blackslash band members may want to check their vinyl record collection. They might find they're missing some choice New Wave of British Heavy Metal and assorted Eighties metal albums, like Iron Maiden, Judas Priest or Angel Witch, for instance. Yep. 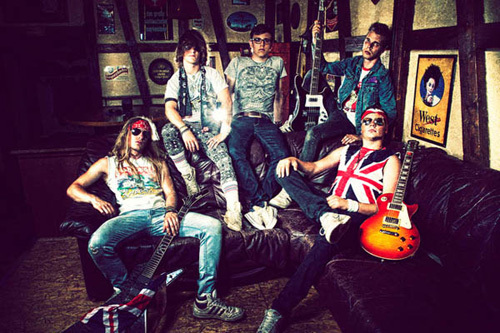 Blackslash, a band of youngsters from Germany, play old school traditional, "keep it true," heavy metal. And, frankly, they're pretty darn good at it. They have the fundamentals worked out. Melody and harmony from twin guitars and vocal arrangements. A steady and driving rhythm section to execute tempos from moderate to speedy. Clean melodic vocals sometimes backed up by, traditional to the genre, gang vocals. A truckload of large riffs and roaring solos. And, all this wrapped up in some fine rock groove. These are all things that made us fans of heavy metal from its inception. 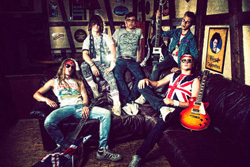 On the more power speed metal side, you have songs like Empire Rising, Rock n Roll, or Wild and Free. You'll catchy some of that aforementioned rock groove in fast-paced Lucifer's Reign, also a fine example of the harmonious vocal arrangements. Alternatively, Edge Of The World uses groove and rhythmic pacing to drive the catchy harmonious riffage, giving the song a marching, epic, feel. Blackslash even ventures into metal anthem territory with the milder Made Of Steel, which moves by vocals over lighter guitars throughout. Bottom line: Blackslash's Sinister Lightning is a fine and entertaining platter of classic heavy metal made engaging for the present era. Easily recommended. 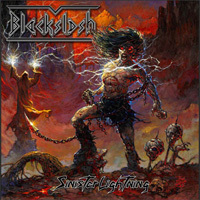 Blackslash's Sinister Lightning is a fine and entertaining platter of classic heavy metal made engaging for the present era. Easily recommended.